Jaclyn is an Associate with Preti Flaherty’s Business Law group, practicing from the firm’s Concord, New Hampshire, office. 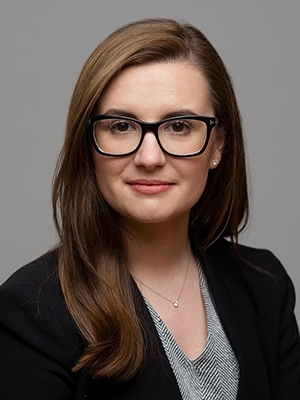 She focuses her practice on a wide range of matters, including general corporate law, mergers and acquisitions, tax law issues, commercial contracts, and other transactions. Jaclyn is a graduate of the University of New Hampshire School of Law, where she served as the managing editor of the University of New Hampshire Law Review, worked as a legal resident for the Honorable Andrea K. Johnstone of the U.S. District Court for the District of New Hampshire, and gained litigation experience as a summer associate for a large regional law firm. While at UNH, Jaclyn was a member of the Daniel Webster Scholar Honors Program, and was awarded the Yacos Award for her commercial litigation work as a student attorney on a pro bono case through the school’s Consumer and Commercial Law Clinic. Prior to law school, she worked on K Street in Washington, D.C., for both a lobbying firm and the Federal Labor Relations Authority. A Granite State native, Jaclyn lives in Concord, New Hampshire.